Madder (Rubia tinctorum) is one of the most ancient dyes and a particularly useful and reliable source of red. Other plants in the madder family (Rubiaceae) include the native plants lady’s bedstraw (Galium verum), wild madder (Rubia peregrina), hedge bedstraw (Galium mollugo), dyer’s woodruff (Asperula tinctoria) and woodruff (Galium odoratum). Although madder (Rubia tinctorum) was available during the Roman period, it seems to have been replaced during the early Anglo-Saxon period by the native Rubiaceae (for example:lady’s bedstraw and wild madder). This suggests that the Romans imported madder as a dried dyestuff, rather than growing it in Britain, and that it disappeared with the departure of the Romans. There is evidence that madder began to be imported from France in the 7th century and by the later Anglo-Saxon period it had become a very common dye. The analysis of dyes in textiles of the early Anglo-Saxon period seems to indicate that reds, like purples, were mainly used for narrow woven bands, headdresses, embroideries and accessories, such as bags, rather than for larger fabrics. Where dyes were used in larger fabrics (and dyes were detected in only one-third of the larger fabrics analysed) these were mainly dyes that give shades of yellow, blue and brown, plus green from blue and yellow dyes used in combination. It is also possible that, at least in the early Anglo-Saxon period, reds and purples were colours reserved for people of high status. An alum mordant is necessary for true reds from madder (Rubia tinctorum) and reds achieved on a clubmoss mordant are very similar to those achieved on fibres mordanted with mineral alum. Without a mordant, madder gives colours in the orange to coral range and using a tannin mordant gives similar but slightly deeper colours. An alkaline modifier, such as wood-ash-water, makes the colours pinker in tone and an iron modifier makes the colours browner. The addition of chopped crab apples to the dyebath makes the colours brighter. In my experience it is not easy to obtain true rich reds from lady’s bedstraw, wild madder, dyer’s woodruff and woodruff. I grew all these for several years in my old garden but never managed to get the sort of red obtained from madder, also grown in my garden. The use of an alkaline (wood-ash-water) modifier moves these colours further towards red and an iron modifier makes the colours browner. I intend to continue experimenting with these dyes in the madder family – if, that is, I can grow enough roots to make the tests worth the effort. Lady’s bedstraw grows wild at the sides of many country roads in this area but it is against the law to uproot wild plants, so I shall have to rely on my home-grown plants and it will be a while before they are mature enough to harvest. This is the next post about my Anglo-Saxon-style experiments. 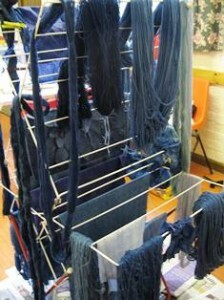 Today’s natural dyers tend to use mainly aluminium mordants and sometimes iron and copper, which may also be used after dyeing as colour modifiers. 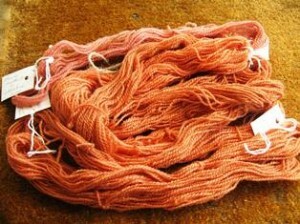 Chrome, which was not introduced as a mordant until the 19th century, has been popular among some dyers but is avoided by many nowadays because of its toxicity. Similarly tin, which was first used as a mordant in the 17th century (mainly with cochineal to produce bright reds) is now less frequently used, partly because of environmental considerations and partly because it can make fibres brittle. Copper was used by early dyers in the Mediterranean world and also in India in the classical period AD300 – 700 but, of the metallic mordants mentioned above, only alum and iron seem to have been used by the Anglo-Saxons. It is also possible that pots made of metals, such as iron or bronze, may have been used as dyepots and this may have had an effect on the colours. However, the only evidence of dyestuffs staining pots in the early Anglo-Saxon period occurred in pots made of clay and dyeing may have frequently been carried out in clay pots, which would probably not have had a significant effect on the colours produced. Many of the dyes used by Anglo-Saxon dyers will fix adequately without a mordant and I think it is likely that many fibres would have been dyed in this way. Some textile fragments from the period show evidence of an alum mordant and mineral alum from the Mediterranean was probably used during the later Anglo-Saxon period. However, there is some doubt as to whether this mineral alum would have been available earlier in the period, so alternative mordants may have been used, such as aluminium extracted from clubmosses. Plants rich in tannins, such as oak galls and blackberry leaves and shoots, may also have been used as mordants. Use 200% clubmoss (Lycopodium spp), chop it up and put it into a pot filled with water, then heat to 40C. Hold at this temperature for 3 days. On the fourth day boil it up briefly and then strain off the liquid. Add the fibres to be mordanted, heat slowly to 40C and then allow to cool Repeat this process daily for 3 days. 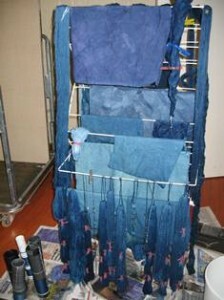 Then remove the fibres and squeeze the excess liquid back into the solution, which can be re-used once. In order to be sure that aluminium had been extracted and then absorbed by the fibres, I used fibres mordanted with 10% mineral alum and unmordanted fibres as “controls” in the dyebath. The results were particularly clear with madder dye – the unmordanted fibres dyed to a coral shade but both the alum-mordanted and the clubmoss mordanted fibres dyed to an almost identical red shade. I also experimented with the use of iron and wood-ash-water, which is alkaline, as colour modifiers after dyeing. It is also possible that stale urine may have been added to dyebaths and this would have increased alkalinity. To make iron water, put some pieces of scrap iron or rusty nails in a large container with a well-fitting lid and fill it up with a solution of two parts water to one part clear vinegar. Leave the iron to steep in this solution for a week or two, until the solution is orange in colour. When you use the iron water, strain it through a fine-meshed sieve or a piece of muslin. To make wood-ash water, put the ashes from a wood fire into a large glass or plastic container with a well-fitting lid. Fill up with water and leave the ashes to steep for a week or two, until the liquid is yellow in colour and feels slick or slimy to the touch. When you use the solution, pour or siphon it off without disturbing the ash sediment. Wood-ash water can be used as an alkaline modifier and as the source of alkali in woad vats. It can also be added to dyer’s broom and weld dyebaths to increase the depth of colour. 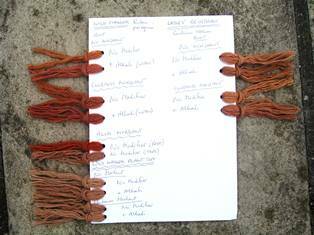 My experiments are intended to demonstrate some of the possible methods used by Anglo-Saxon dyers and to give an idea of the colour range they might have achieved. Although we don’t know exactly how early dyers worked, there is enough evidence to indicate that they would have been able to achieve a wide range of bright, rich colours from the relatively small number of dyes they used. 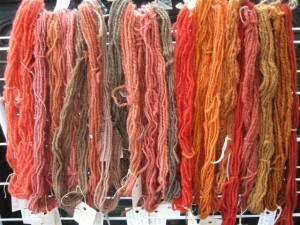 I will write about individual dyes in later posts.